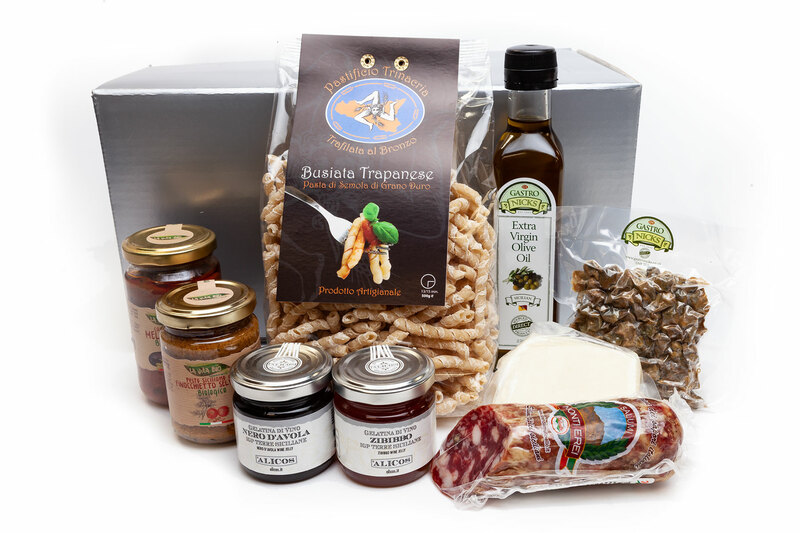 A hamper of classic Sicilian fare from small artisan producers around the island. 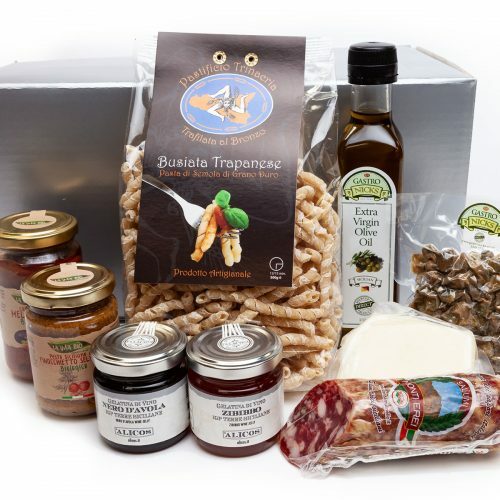 Do you have a holiday in Sicily planned and want to sample before you travel? Have you returned from Sicily and crave the traditional Sicilian produce? Very traditional, hand-made Sicilian durum wheat pasta – Anelletti – traditional little ring shape, perfect for collecting tasty pesto or sauce! Made in North West Sicily close to Alcamo. Caponata, from the same producers – made from seasonal vegetables and served warm as part of the main meal of the day. Very similar to Ratatouille. 250 ml of our wonderful Extra Virgin Cold Pressed, Single Estate Olive Oil. Beautifully balanced with a hint of pepper at the end. Artisan Salami from central Sicily – soft and fruity with a hint of pepper. At its best when very thinly sliced. Normanno cheese with from Salemi A semi-aged sheep’s milk Pecorino cheese, matured for approx 30 days and marinated in balsamic vinegar to give a mild, but persistent flavoured cheese. Wonderful drizzled with honey or with one of our two wine jellies. Fig Preserve, made from plump Sicilian figs, sweet, delicate and delicious with cheese, roast ham or greek-style yoghurt’. Packed for you in a silver/red ‘Gastro’ hamper box or open wicker hamper for you give by hand.